Sky B. Connolly, M.D., F.A.A.D. Suraj G. Reddy. M.D., F.A.A.D. Shilpa G. Reddy, M.D., F.A.A.D. We invite you to visit our state of the art facility! We are located ½ mile from our previous location with easy accessibility. you have come to experience at Albuquerque Dermatology. Our team of dedicated dermatologists is committed to providing the highest quality of medical skin care available. With compassion and respect, our physicians can treat even the most challenging skin problem. Our expertise encompasses all diseases related to the skin, hair and nails. We utilize the most recent advances in dermatologic therapy to offer you the highest level of care available. Our dermatologists are all certified by the American Board of Dermatology and have spent years in specialty training to better serve you. Please browse through our website, and if you have any questions, feel free to contact us via phone or email. Thanks for visiting! IMPORTANT NOTE: With increasing complexities regarding insurance coverage, patients are encouraged to verify their insurance with their respective carrier/carriers prior to making an appointment. Here at Albuquerque Dermatology Associates (ADA) we strive to provide our patients with as accurate information as possible regarding their insurance acceptance at our facility: however, this cannot be completely confirmed until the patient is able to be present at our facility. Coverage cannot be confirmed until the insurance card is available for our inspection. Albuquerque Dermatology Associates reserves the right to cancel any patient appointment at any time if verification of insurance cannot be made. Some insurance carriers such as Blue Cross Blue Shield may report to their clients that ADA provides services for their subscribers. This is not entirely true. For All Medicare Patients: Due to Medicare and government mandates, all physicians are now strictly required to obtain various detailed information regarding health related issues on all Medicare patients. The time required by our office staff and physicians to obtain this information is significant; therefore, your participation in providing us with this information is much appreciated so that we can more effectively maintain a regular, consistent, on time schedule with our patients. Meaningful Use is a Medicare Program that was created to empower patients with the ability to examine their medical data online from a home portal. It was also created in an attempt to improve quality of care. In addition, the Medicare mandated program called Physician Quality Reporting System (PQRS) is an information gathering program that we are told will improve quality of patient care as well. If you feel that the request for such information is personally invasive and you disagree with these government mandated programs, please feel free to contact Medicare Services at 855-252-8782. We also recommend that you contact New Mexico’s State Senators, Martin Heinrich at 505-346-6601 and Tom Udall at 505-346-6791 to voice your opinions and file formal complaints. 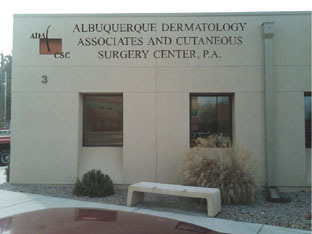 © Albuquerque Dermatology Associates & Cutaneous Surgery Center, PA. All rights reserved. Design by SAVAGE INTERNET.